The New Team Duraspeed 2 pump is a twin impeller pump that is designed to boost both the hot and cold water supplies to your shower. We recommend that all Duraspeed pumps are fitted in the airing cupboard with the cold water supplied from your cold water storage tank, this is usually found in your loft, and the hot water supplied from your hot water storage cylinder. Replacement for a 6 year old Newteam pump. Easy to install as a DIY project. The pump was a direct replacement for a "Showerforce" unit. 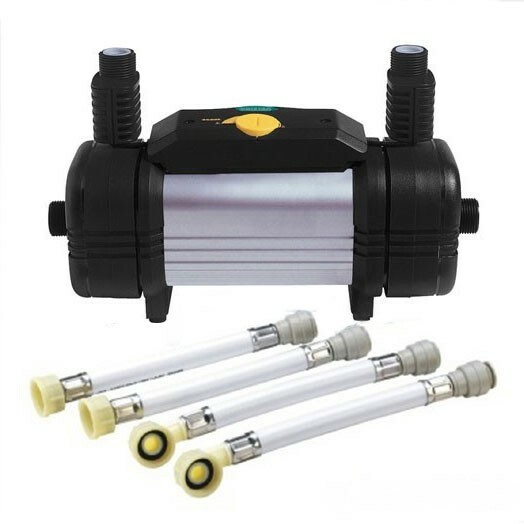 I am extremely un-talanted in the sphere of DIY, and the pump is located in a very unhelpful position (not as recommended in the original installation instructions) however, the push-fit flexible hoses that were supplied made the job much easier... Read More. The pump was a direct replacement for a "Showerforce" unit. I am extremely un-talanted in the sphere of DIY, and the pump is located in a very unhelpful position (not as recommended in the original installation instructions) however, the push-fit flexible hoses that were supplied made the job much easier than it might've been. Got back from the office at 8pm, lay on the floor in the bathroom and swore at the bath a few times and by 9pm we had a fully functioning shower! This was a like for like replacement shower pump. Good - as requested an exact replacement - an excellent shower pump . Had one prior to this one for about 10 yrs and it became faulty so bought another as its a direct fit. Excellent webpage, easy to use, great service. Easy to fit item and working well!! The original pump was installed but was faulty (leaking). I raised with Dionne and a replacement was once again with me within 24hrs. I am now waiting free collection for return and refund on this original pump. Product : Happy with the product. Product : I think is ok, did not have time to look into alternative product so difficult to be 100% fair but up and running in no time! Just replaced a similar one with leak on one side but was 10 years older and with bad installation. Service rating : Perfect, prompt service with excellent pricing and product range. Product : Like for like replacement. Perfect. Product : The right product for the job. Described correctly on site. First class courier firm APC. Called to arrange re-delivery, got straight through to a Human Being - no queues, automated phones. Well done. Service rating : Very quick, excellent service. Efficient and swift delivery of product and extremely well packed.